Join us for a glass of bubbly while we hear from Screencraft Keynote, Peter Craig. 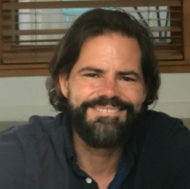 Peter Craig is a screenwriter and novelist whose work includes The Town(2010), The Hunger Games: Mockingjay Part I (2014),The Hunger Games: Mockingjay Part II(2015), Blood Father (2016), and 12 Strong (2018), as well as several movies currently in production including Top Gun: Maverick (2020) and Bad Boys 3 (akaBad Boys for Life) (2020). His novels include Blood Father, Hot Plastic, and The Martini Shot. Currently he is working on a second Gladiator movie with Ridley Scott, set twenty years after the original. He lives in Los Angeles.